Infrared satellite image of Hurricane Andrew at 5 AM on August 24, 1992, as it was making landfall along the coast of Miami-Dade County, Florida. The hurricane season had yet to see its first named storm in August 1992, but that changed dramatically with the arrival of Hurricane Andrew. South Florida and NOAA’s National Hurricane Center in Coral Gables took a direct hit from Andrew. We’re going to take you behind the scenes for a glimpse of what it was like to be on duty during that fateful week twenty-five years ago. The disturbance that had rolled off the coast of Africa became Tropical Storm Andrew on Aug. 17. But three days later, it almost disappeared. 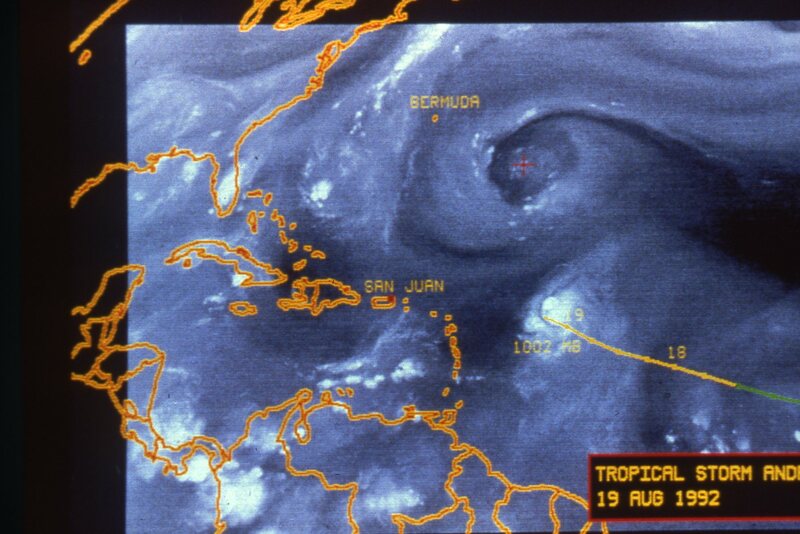 Water vapor satellite image of Tropical Storm Andrew on August 19, 1992, while it was struggling to survive northeast of the Lesser Antilles. It was a wise decision. Just two days later, the Hurricane Hunter aircraft found a lower air pressure and better organization. On Saturday morning August 22, they found hurricane-force winds. 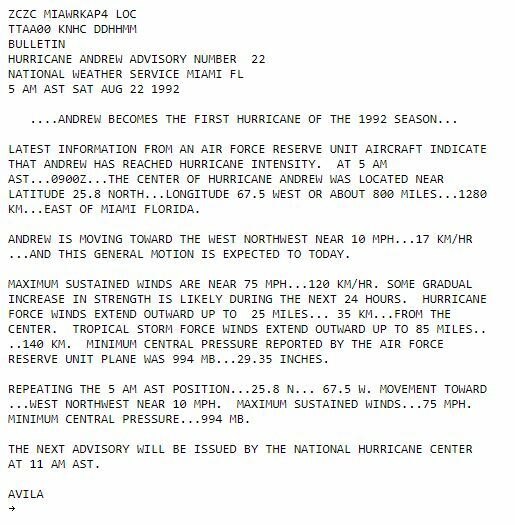 Public Advisory issued by Hurricane Specialist Lixion Avila at 5 AM on Saturday, August 22, 1992, making Andrew the first hurricane of the 1992 hurricane season. Forecast discussion issued at 5 AM on Saturday, August 22, when Andrew was designated as a hurricane. Later that same day, Hurricane Research Division (HRD) scientists James Franklin and Dr. Mark DeMaria boarded the NOAA Hurricane Hunter WP-3D aircraft in San Juan as part of a dropwindsonde mission to better sample the winds around the hurricane. 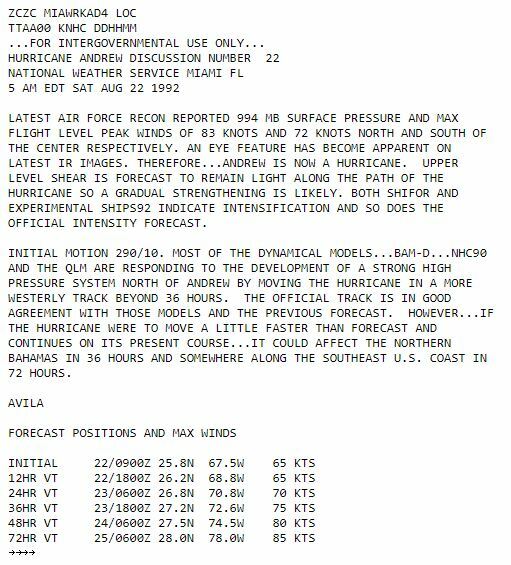 The mission ended in Miami about midnight and both went to NHC to see if the new data had an impact on the forecast models. “The models now showed Andrew’s path much farther south and a direct threat to Miami-Dade County,” said DeMaria who, along with Franklin, would go on to become part of the NHC management. 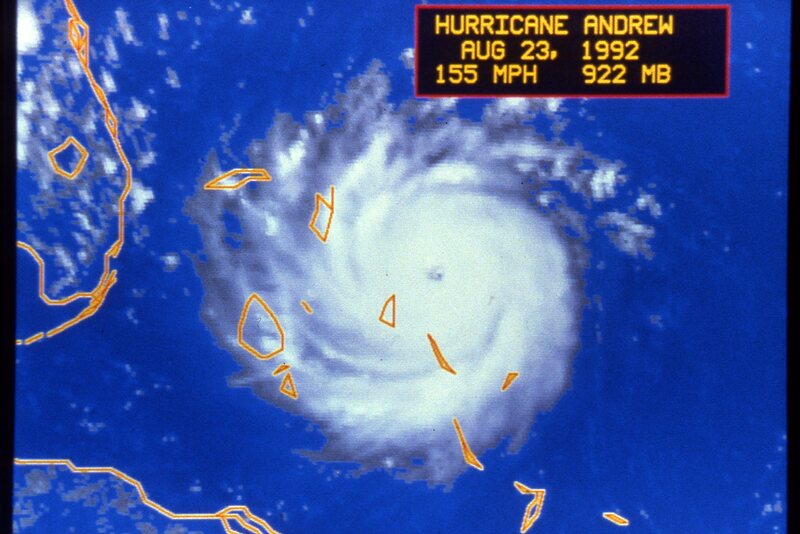 Satellite image of Hurricane Andrew on Sunday, August 23, 1992, as it was headed toward the Bahamas and South Florida. Andrew continued to rapidly strengthen as it approached South Florida. In the pre-dawn hours of August 24, its eye, with winds screaming at more than 155 mph around it, neared the Dade County coastline. Hurricane forecaster Dr. Ed Rappaport recalled how tense that night was, but he and many others were oblivious to the chaos outside. They were all focused on the analysis and typing out the 5 a.m. advisory with the updated forecast and warnings. 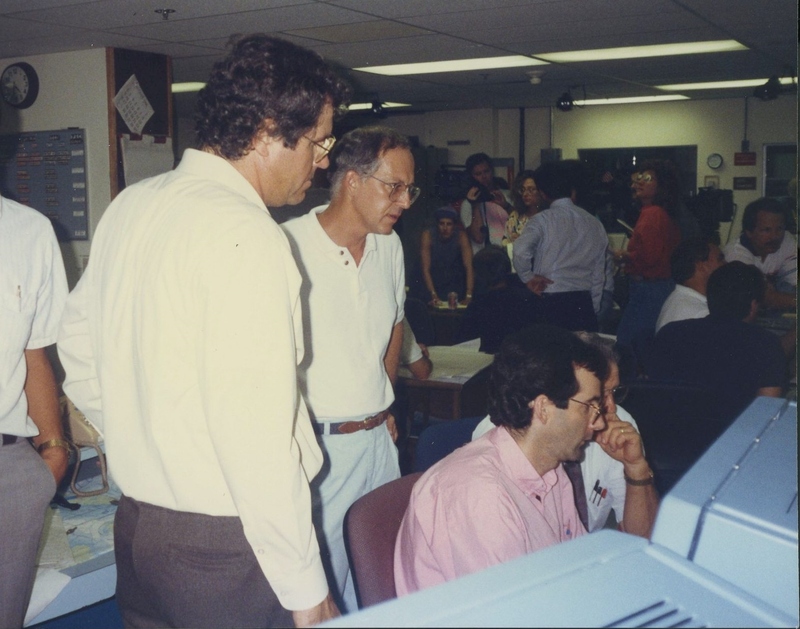 Hurricane Specialist Dr. Ed Rappaport prepares the 5 AM August 24 advisory for Hurricane Andrew, with the help of Hurricane Specialists Hal Gerrish, Dr. Richard Pasch, and Max Mayfield, as the hurricane rages outside. Public advisory for Hurricane Andrew issued at 5 AM on Monday, August 24, as the hurricane’s eye was moving onshore in southern Miami-Dade County. “When the advisory went out, somebody came up to me and said, ‘What do you think?’ I said, ‘about what?’ And he said ‘Well, the building’s swaying!’ A few minutes later, the anemometer measured a wind gust to 164 mph,” Rappaport said. And then there was the time the whole building shook. No one knew what it was, but NHC radar meteorologist Martin Nelson noticed the Miami radar, a WSR-57 (Serial #1), quit working. “We believe another antenna broke loose and hit the fiberglass dome. Once that happened, the actual radar antenna was exposed,” Nelson said. Part of that dome fell and landed on top of his pickup truck, while many other dome parts were blown down U.S. Highway 1. Radar fixes of Andrew’s trek over South Florida were captured by the new Doppler radar in Melbourne, Florida. 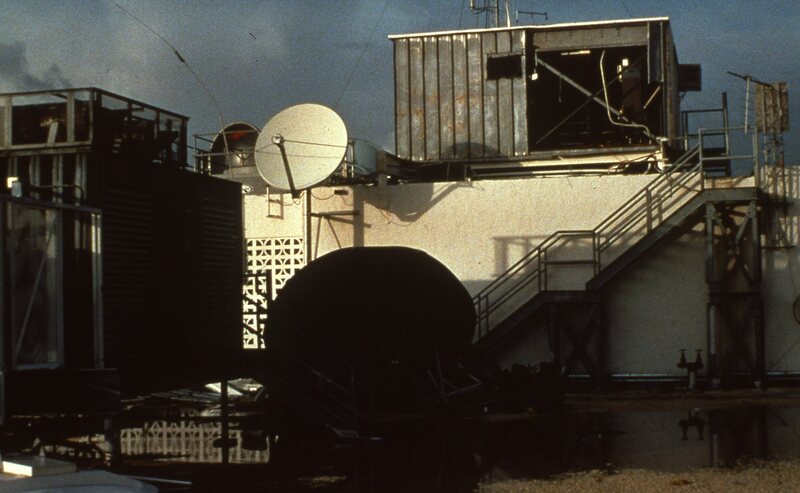 Radar on top of the building in Coral Gables that housed the National Hurricane Center at the time, destroyed by Hurricane Andrew’s winds. The day before Andrew made landfall, several NHC forecasters were sent to NOAA’s National Meteorological Center in Maryland to back up NHC just in case it was needed. One of those forecasters was Hugh Cobb. He was taking a break in his hotel room hours after Andrew made landfall and turned on CNN where the newscaster was talking about damage to the hurricane center. 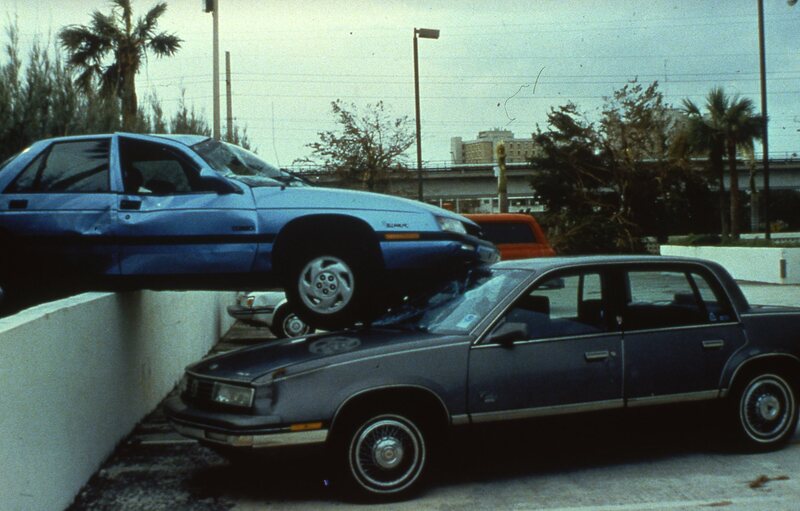 Cars at the National Hurricane Center damaged by Hurricane Andrew. The car in the lower right of the image was owned by forecaster Hugh Cobb (now the branch chief of the Tropical Analysis and Forecast Branch), who was deployed to the National Meteorological Center in Maryland in case NHC needed to be backed up. Several other employees lost their cars. Worse, two dozen NHC and HRD employees had suffered major damage to their homes. Seven of those homes were destroyed. NHC moved into a new single story facility three years later, well inland on the campus of Florida International University. Herb Saffir, a structural engineer, had a hand in the fortified design of the building. If the name sounds familiar…he is the “Saffir” in the Saffir-Simpson Hurricane Wind Scale. 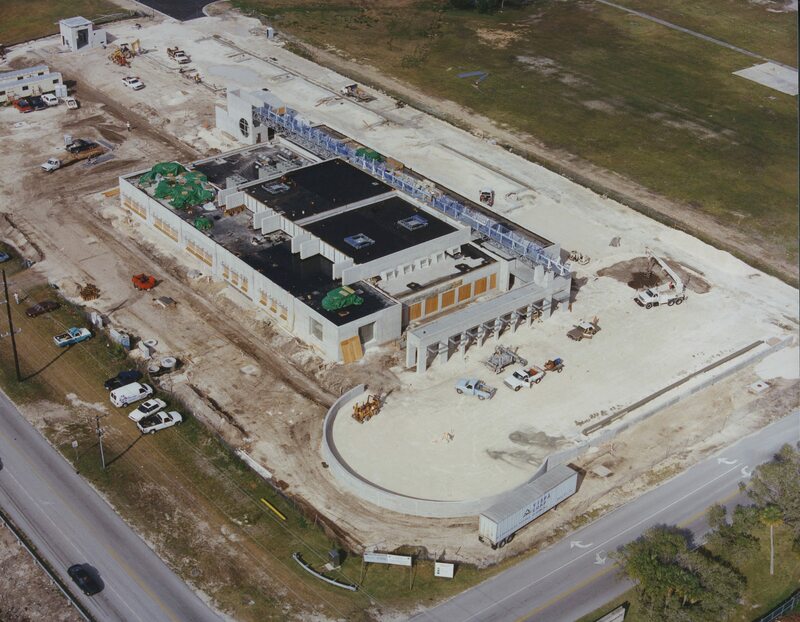 Construction of the new National Hurricane Center and Miami-South Florida Weather Forecast Office in 1995 on the campus of Florida International University in the western portion of Miami-Dade County. When another hurricane strikes, especially one with the power of Andrew, things will be different. 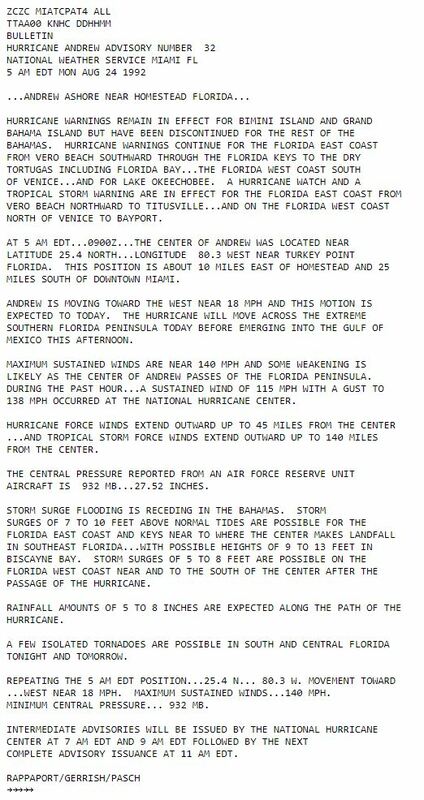 This entry was posted in NHC and tagged Andrew, Hurricane Research Division, National Hurricane Center.